My name is Shelley Awad, and I am a published Best-Selling Children's Author residing in Tecumseh, Ontario. I have visited many elementary schools and presented The Greenhouse Kids series of chapter books to students. I am passionate about educating students on the importance of reading, and my goal is to teach them the value of books in a fun and exciting environment. I am pleased to announce the Readers Grow Into Leaders Literacy Program for elementary schools, and you can become a part of this dynamic cause. Do you remember your schooldays? Laughter, skinned knees, adventure and creating friends for life were all a part of growing up. The impact of school and the benefits of reading cannot be underestimated. The Greater Essex County District School Board and the many elementary schools in our community are excited to participate in this program. Almost half of Canadian adults (48%) have low literacy skills according to the Canadian Council on Learning, a non-profit organization in Ottawa. We need to turn the page on illiteracy today so that students can grow into adults who can thrive in any economy. The best way to accomplish this goal, is to introduce students to the benefits of reading when they are young. You have the opportunity to be a huge part of this literacy program by becoming a corporate or individual sponsor. Sponsors supply The Greenhouse Kids books for students in our elementary schools. You can supply enough books for an entire school, class, or as many as you like. You can spark the excitement of reading within a child. Each book is $13.00 (taxes included). Simply let us know how many students you would like to sponsor. The books will state whom they were sponsored by, and you are welcome to include your own personal message. We will prepare the label that will be placed on the inside front cover for you. Sponsors will be notified of which school and class received their books. Please let us know the wording for your labels. At the end of my author visit, I will surprise each student with a signed book. Can you imagine the excitement that the children will experience? This is especially important for those students who are not introduced to reading at home, who have English as a second language, or for those families who simply cannot afford books. All of my time is donated free of charge to the schools. Schools who wish to receive the author visit and books will need to email shelley@greenhousekids.com or call 519-979-2041. All students receiving books must send their sponsors and the author a thank you letter by mail. Perhaps older students could submit a book report as part of a classroom assignment. Younger students can prepare artwork depicting their favourite scene or character. These assignments will be left up to the discretion of the teachers. "Our grade 3 through 6 students and teachers of D.M. Eagle School were happy to have local author Shelley Awad back for a visit! Many of the children are hooked on reading about the adventures of The Greenhouse Kids. Having read her first novel The Greenhouse Kids, Dan Delion's Secret, our students were excited to have the opportunity to listen to the author and ask questions about her latest novel, The Greenhouse Kids, Ghost Walk. The students were delighted to purchase and receive their own signed copies from her! Thank you, Shelley for adding to the excitement of reading with your great adventure/mystery novels and for coming to our school to show our children that becoming an author begins with reading and having a passion to write." "In the Fall of 2009 I read "The Greenhouse Kids, Dan Delion's Secret" to my Grade 3 class. They were excited to continue with the mystery and were always disappointed when the class was over knowing that they would have to wait another day to hear more. After completion of the book the children were thrilled to hear that the author, Shelley Awad, was able to come into the class for a visit. They had not met a real author before and they were anxious to share their opinions regarding her writing as well as to ask her many questions regarding her career. They were anxious to inquire as to whether there would be a sequel in the future. Shelley was very comfortable with the children, calm and well-spoken. She shared how she had been an avid reader when she was their age and how that had led to wanting to be a writer. The children were absorbed as she explained what went into the composition and publishing of a book. Shelley was very skilled at answering their questions, keeping the information at their level. She was exceptional at sharing just enough information regarding her sequel and left the students looking forward to its release. Her calm manner, interesting presentation and her appreciation of the children made her visit a very positive experience for all. After reading her second book, "The Greenhouse Kids, Ghost Walk" Shelley came for a return visit and the students were full of comments and questions. It was aparent that Shelley was just as excited to see the children as they were to see her. An excellent conversation took place and the students were sorry to see her go. She gave them just enough information regarding her third book, leaving the students anxious for its completion. As a teacher it was great to have Shelley in my classroom. She instilled her love of reading upon the children and her devotion to writing. Shelley has the gift of writing as well as the ability to relate to young children the wonders of language and literacy! 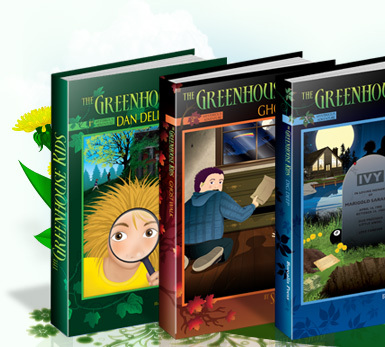 The Greenhouse Kids, Dan Delion's Secret - All of the kids are named after flowers and plants and share their same traits. That's why Dan Delion's growing like a weed and he has spiky blonde hair. The Greenhouse Kids never imagined the mysterious adventure that was about to unfold. 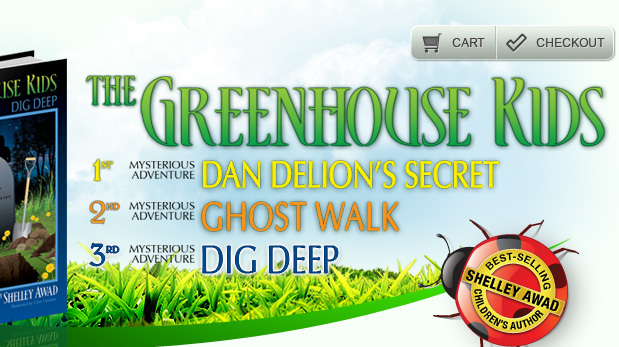 The Greenhouse Kids, Ghost Walk - Ghost Walk is the second mysterious adventure in the series, and continues the story of Dan Delion's Secret. Lucinda the Ladybug continues to help them out with life lessons. The Greenhouse Kids learn the importance of friendship, courage and confidence. They discover that if you believe in yourself, miracles really can happen. Meet The Greenhouse Kids - Introduces young readers aged 3 to 6 to the charming garden-themed characters and their flower namesakes. Scenes from Dan Delion's Secret and Ghost Walk are also depicted. The Greenhouse Kids, Dig Deep - Soon to be released! Part mystery and part educational, these gardening-themed books will appeal to students in grades 1 through 6. We will be targeting students in grades 3 and 4 in the upcoming school year.